to promote all aspects of soaring for women glider pilots. St. Louis Soaring Association (SLSA) is located 3 miles East of Highland, Illinois, about 35 miles East of St. Louis, Missouri in great flying country. 1) Register on-line; or email Charlotte@womensoaring.org for a printable form. 2) Pay your registration fee - by Paypal if possible. 3) Registration has two levels, you are either Non-flying folks who share Seminar events and meals, or Flying folks. These have two different prices. The same registration fees apply to youth, associate, and full WSPA members. 4) All seminar participants need to be current WSPA members at the time of the Seminar. Dues are $20 per year for full (women) and associate (men) members, and $10 for youth members. You can pay your WSPA dues with your registration. 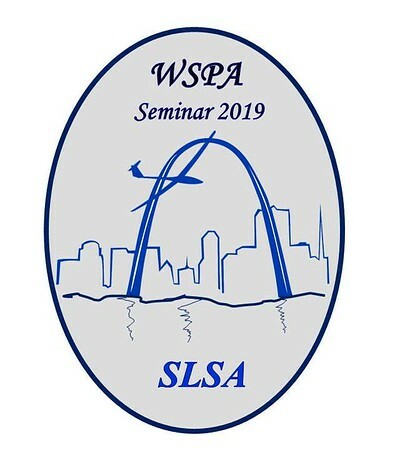 5) Pilots registering to fly at the Seminar will have temporary membership in St. Louis Soaring, and so need to be SSA members. St. Louis Soaring is an SSA club, and SSA membership is required by our club rules. Contact the Soaring Society of America directly if you need a 1-year membership in that society. 6) You are responsible for your own lodging arrangements. Some information is provided below. Airport. SLSA owns and operates the Howard Blossom Gliderport at Highland-Winet field (designation: H07), a grass field where glider flying is the main activity. SLSA club and field information is at www.stlsoar.org. Our club glider fleet will be available to Seminar participants to fly. A field checkout is required for flying both our equipment and yours, so plan for that; and an instructor checkout is required for solo flight in each of our ships by club rules. Our glider fleet has four two-place ships: a K-13, a G-103, and two K-21's, and four single-place ships: a 1-26C, a 1-34, and two G-102's. We have high-speed internet at the field, and a custom Condor 2 simulator. If you are flying in to join us at the Seminar please note that no fuel is available on our field, you'll need to go 10 miles East to Greenville, Illinois (GRE). Also, the power and glider pattern are separated on opposite sides of the field, don't mix these up, and there is a ditch you should probably know about for taxiing. Contact Charlotte ahead of time for a briefing. Lodging. The nearest motel to the Seminar site is the Baymont Inn in Highland, Illinois, about 3 miles away, reservations at 866-238-4218. Their cost is expected to be under $100 per night for a room with 1 bed, at least if you register well ahead of time. There is plenty of camping space for tents and RV's at the St. Louis Soaring field, and at the Silvercreek Glider Club about 10 miles north: www.silvercreekgliderclub.com. The next-nearest motels to the Seminar site are in Troy, Illinois, about 15 miles West at the junction of I-70 and I-55, with a Red Roof Inn, Best Western, Holiday Inn, and Super 8.